As an early bloomer, Forysthia goldenly announces spring. • An Old World plant native to Eurasia, forsythia is grown successfully in Canada and the United States. 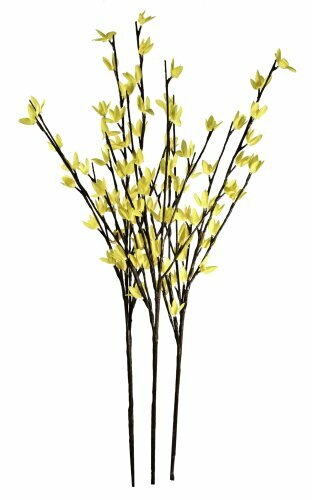 Mary Ellen Bottom Solt (July 8, 1920 - June 21, 2007) perfectly captured the shrub's graceful goldenness her anagrammatic visual poem "Forsythia." • Flowering dogwood (Cornus florida). Forsythia heralds spring, delicately, goldenly, faithfully. Its stems, golden rayed with profuse sunny flowers, spring upwards from the ground. Forsythia is a flowering plant in the olive family Oleaceae, which is characterized by opposite leaf arrangement whereby leaves grow in pairs on opposite sides of the stem. Forsythia’s genus name is also its common name. The genus name honors William Forsyth (1737 - July 25, 1804), a Scottish botanist who co-founded the Royal Horticultural Society (RHS) in 1804 in London, England, with six other gardening and horticultural devotees. Forsythia is comprised of eleven species, of which one is native to southeastern Europe and the rest are largely native to eastern Asia. One is native to southeastern Europe: Forsythia europaea in Albania and Serbia on the Balkan Peninsula. Two in Korea (Forsythia koreana, Forsythia kovata). 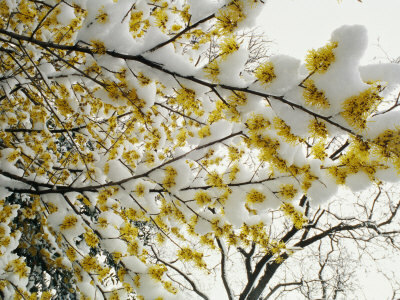 Along the eastern seaboard Forsythia thrives in four New England states (Connecticut, Massachusetts, New Hampshire, Rhode Island) as well as in Maryland, New Jersey, New York, North Carolina, Pennsylvania, and Virginia, along with its neighbor, West Virginia. Inland locations are Arkansas, Illinois, Kansas, and Tennessee. Forsythia is present in the Gulf state of Alabama. Forsythia's species tend to be found in areas with minimum tolerable winter temperatures ranging from -30º to -20º Fahrenheit (-34º to -29º Celsius) up to 20º to 30º F. (-7º to -1º C.), i.e., U.S.D.A. Hardiness Zones 4 to 9. Forsythia x intermedia and Forsythia viridissima are classed in Zones 5 to 9 and therefore tolerate minimum winter temperatures ranging from -20º to -10º F. (-29º to -23º C.) up to 20º to 30º F. (-7º to -1º C.). Forsythia suspensa, comfortable in Zones 4 to 9, accepts minimum winter temperatures of -30º to -20º Fahrenheit (-34º to -29º Celsius) up to 20º to 30º F. (-7º to -1º C.). Two species with an early introduction to the West, Forsythia suspensa and Forsythia viridissima, are still immensely popular on both sides of the North Atlantic. Forsythia suspensa was noticed by Swedish naturalist Carl Per Thunberg (November 11, 1743 - August 8, 1828) during his tenure from August 1775 to November 1776 as head surgeon for the Dutch East India Company (Verenigde Oost-Indische Compagnie) at their trading post on the small artificial island of Dejima (“exit island”) in the Bay of Nagasaki. The species appeared first in the Netherlands in 1833 and then was introduced afterwards in England. Forsythia viridissima, flourishing here, was introduced into Europe in 1844. Five decades later Forsythia x intermedia was discovered in the garden by Dr. Hermann Zabel. Botanische Garten der Universität Göttingen (Old Botanical Garden of Göttingen University) in northwestern Germany in 1878. Dr. Zabel was Director of the Forstbotanischer Garten (Forest Botanical Garden) in the nearby town of Hannoversch Münden. Giving it the name of Forsythia x intermedia, Dr. Zabel published his formal description and naming of the hybrid in 1885 in Gartenflora (34(2):35-36, pl. 1182, fig. 2-4), a monthly continental European garden journal that was started in 1852. The hybrid’s first introduction into the United States was in Harvard University’s Arnold Arboretum in 1889. Deemed to be a cross between Forsythia viridissima and Forsythia suspensa, the hybrid is one of the most popular varieties of this early flowering shrub. As with many deciduous plants, Forsythia produces flowers before foliage as a strategy for pollination. Its bright yellow flowers are deeply lobed into four petals that join at the base, so their corolla (all petals as a unit) is termed botanically as being sympetalous (Greek: sym "with, together" + petalon “leaf, thin plate”). Many informal sources casually note that a significant feature of Forsythia flowers is their ability to produce lactose, which is a disaccharide sugar formed from glucose and galactose and which is rarely formed in natural sources, with the exception of milk. Nevertheless, scientific research conducted on Forsythia intermedia in the 1980s by the Faculty of Agriculture at Tohoku University in Sendai, Japan, conflict with reports cited in food chemistry textbooks. The Tohoku University researchers detected glucose, fructose, and sucrose, but no lactose was discerned. True to its family trait, Forsythia has an alternate leaf arrangement. Leaves are usually simple, meaning that their shape is not indented (lobed), as, for example, in oak (Quercus) leaves. Forsythia suspensa sometimes displays two-lobed or three-lobed leaves. Forsythia’s leaves are egg-shaped so their botanical descriptor is ovate (Latin: ovatus “egg”). The edge (margin) of the leaves may be smooth (entire) or saw-toothed (serrated). Forsythia is deciduous so it sheds its leaves in the autumn in the process termed abscission (Latin: ab “away” + scindere “to cut”). In autumn, signaling abscission, foliage turns yellow-green, tinged with purple. Forsythia stems have a yellow-brown color, and they have lenticels (Latin: lenticella, diminutive of lens “lentil”), which are openings in the stem for the purpose of gas exchange between the atmosphere and the plant’s internal tissues. Forsythia viridissima hunkers close to the ground, reaching a height of one to two feet (0.3 to 0.6 meters) and a width of three feet (0.9 meters). As an upright, spreading shrub, Forsythia x intermedia can reach a height of 8 to 10 feet (2.4 to 3 meters) and have a width of 10 to 12 feet (3 to 3.7 meters). Forsythia suspensa stands dramatically at similar heights and a more expanded width, from 10 to 15 feet (3 to 4.6 meters), because of its fine branches that weep, that is, arch and trail. Provided by ARS Systematic Botany and Mycology Laboratory. China. Forsythia seeds are contained within the fruit, which is a dry, brown, inconspicuous capsule that is indehiscent (Latin: dehiscere “to split open”), meaning that seeds are not naturally released at maturity. The capsule is winged as it replicates the seed shape. This type of dry, winged fruit is termed samara (Latin: samara “the seed of the elm”). Forsythia suspensa is esteemed in traditional Chinese medicine, which identifies it as lian qiao (Chinese: 連翹; pinyin: liánqiào) and numbers its fruit, in its steamed and dried medicinal form, among fifty fundamental herbs. Practitioners of traditional Chinese medicine prescribe lian qiao to treat fevers, headaches, and viral infections. Remedies often combine lian qiao with honeysuckle (Lonicera japonica) to unite their antiviral compounds. When split in half, the fruit resembles a chambered heart, which bespeaks its classification as an herb for clearing heat, a common disruptive agent in areas of the body ruled by the heart organ system. Thus, lian qiao is often prescribed by practitioners for blood detoxification. This linking of form with function is consistent with the herbal doctrine of signatures, which is guided by the physical or symbolical resemblance between the imbalance and its remedy. --- and for its perfect rendering of the gracefully enchanting individual stems that make up the exuberant shrub and that compose the shrub’s overall outlines. Forsythia annually telegrams hope as well as fidelity with its assured floral outbursts every spring. Brand, Mark H. (Dr.). “Forsythia x intermedia Border Forsythia.” UConn Plant Database. University of Connecticut Department of Plant Science, Storrs CT. Brand, Mark H. (Dr.). “Forsythia suspensa Weeping Forsythia.” UConn Plant Database. University of Connecticut Department of Plant Science, Storrs CT. Brand, Mark H. (Dr.) “Forsythia viridissima ‘Bronxensis’ Bronx Greenstem Forsythia.” UConn Plant Database. University of Connecticut Department of Plant Science, Storrs CT.
“Forsythia.” Landscape Plants: Images, Identification, and Information. Volume 2. Oregon State University Department of Horticulture, 1999-2011. Fox, Margalit. “Mary Ellen Solt, Poet of Words and Shapes, Dead at 86.” The New York Times, July 3, 2007. Lemaire, Charles, ed. Le jardin fleuriste, journal general des progres et des interets horticoles et botaniques, vol. 2, plate 147. Gand: Imprimerie et Lithographie de F. et E. Gyselynck. (1852). “Research Update: Forsythia suspensa.” Exporting Division Articles and Literatures. MDidea Extracts Professional. mdidea.com. Solt, Mary Ellen. Flowers in Concrete. Bloomington: Indiana University Press, 1966. Titsingh, Isaac. Bijzonderheden over Japan, behelzende een verslag van de huwelijks plegtigheden, begrafenissen en feesten der Japanezen, de gedenkschriften der laatste Japansche keizers, en andere merkwaardigheden nopens dat rijk. Tweede deel. 'S Gravenhage: Widow of J. Allart, 1825. Toba, Takahiro, Satoshi Nagashima, and Susumu Adachi. “Is Lactose Really Present in Plants?” Journal of the Science of Food and Agriculture, January 1991, volume 54 (2): 305-308. TCM Health Info. Traditional Chinese Medicine and Acupuncture Health Information Organization. tcm.health-info.org. von Siebold, Philipp Franz, and Joseph Gerhard Zuccarini. Flora Japonica, Sectio Prima (Tafelband). Leiden: Lugduni Batavorum, 1835. 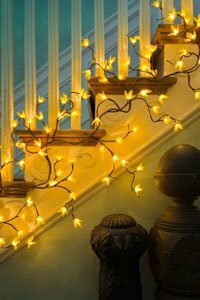 6 foot long bendable, electric twig garland; for indoor use only. Mira, Forsythia definitely brightens the landscape. I love the carefree shape which Forsythia often assumes. I haven't really noticed before that forsythia shrub with branches laden with snow. What a beautiful image! You're right, forsythia does seem to grow happily without requiring much attention. Mira, Forsythia keeps surging in popularity for many reasons, including attractiveness, ease in growing, and uncomplicated care. As you say, it's true that we often start seeing something in nature everywhere once we learn to recognize it! Yes, yellow is prized as a color in China. Additionally, Forsythia has much value in traditional Chinese medicine. 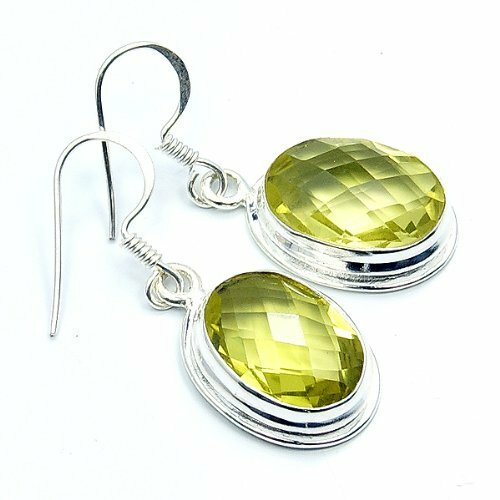 Dustytoes, Forsythia is considered a good luck plant in China, where it symbolizes happiness, joy, and prosperity. That's so charming that forsythia was one of the first plantings at your new house. No matter how small or sprawling, forsythia is gorgeous. One of the first things I planted in the yard of my new house was a forsythia bush. It's still very small, but I love those bright yellow blooms. It's too early for them to bloom here is NH, but soon! VioletteRose, Me, too, I agree that Forsythia has lovely flowers. Forsythia is a popular plant for highway median strips here, so I am enjoying the golden colors as I drive. They are lovely flowering plants. You have shared great information and very beautiful pictures, thank you!